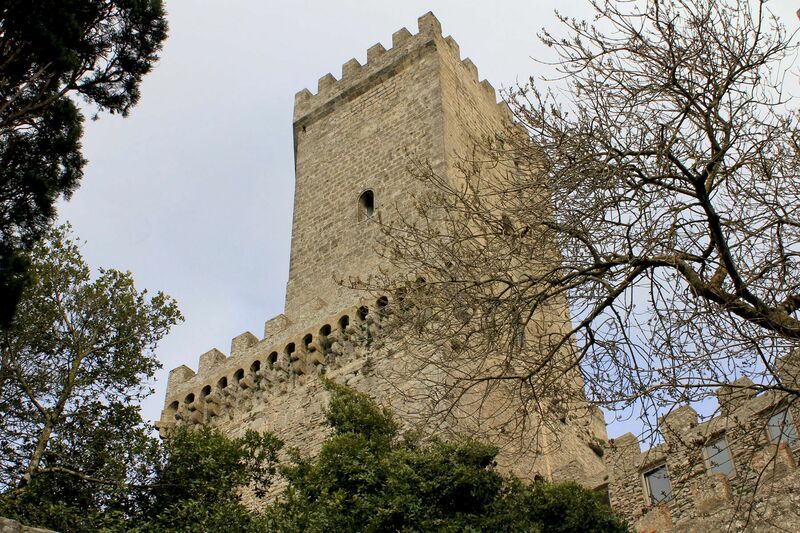 Erice – walking tour across the medieval town explores its secrets, discovers historical monuments like Torretta Pepoli, Castle of Venus, revives legends and myths…. 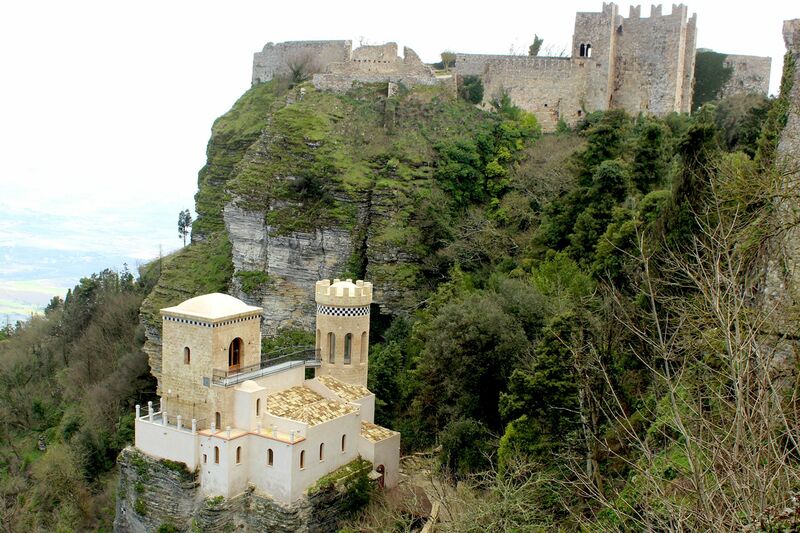 Erice is an open-air museum that preserved not only its medieval shape but also the Middle-Age atmosphere. It’s a place where legends, myths and reality are mixed altogether while enveloping clouds and fog make it even more mysterious. The legends go back to pre-historic times linking little known Elymians to Trojans escaping their destiny after destruction of their homeland (Troy) by Greeks (events from 12th century BC). Obviously legends are “indestructible”, living their own lives for millennia. 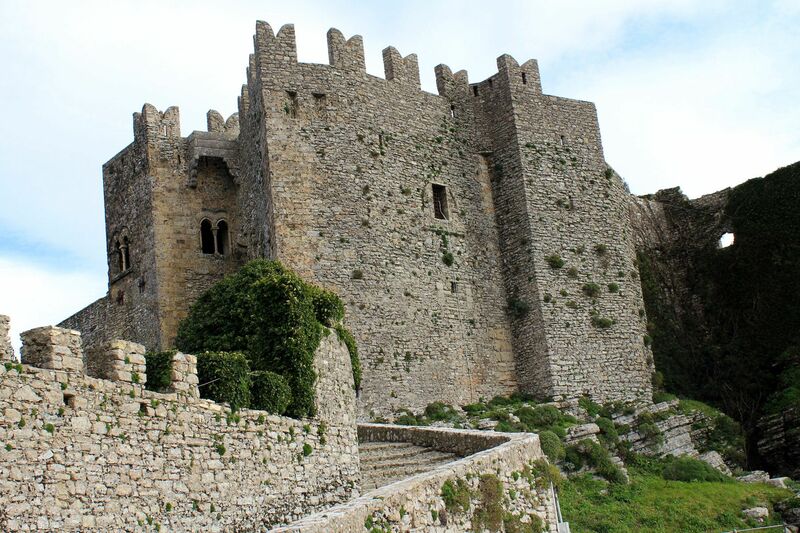 Hard facts are less tolerant to the forces of nature, men and in general “time”, but nevertheless, Erice preserved in quite good shape Punic walls that since 6th century BC defended the prosperous Phoenician city. 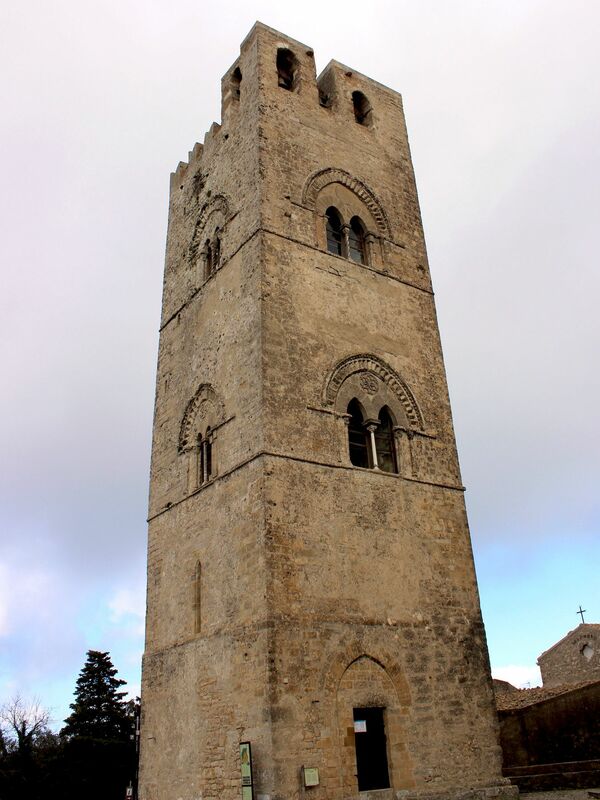 After visiting the --> Erice: Medieval Stone Village (first part of my impressions after climbing to the top of the mountain), here is the second one: Top Sites to see in Erice. 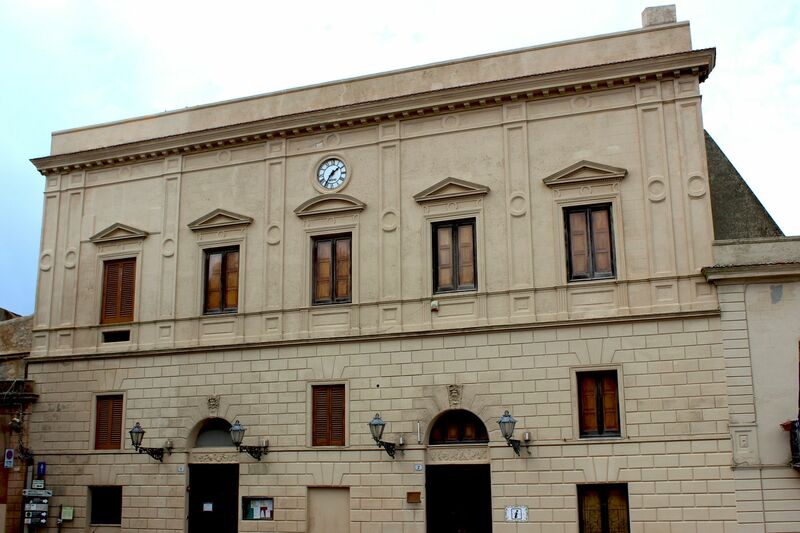 Porta Trapani is the main entrance gate leading to the old town. 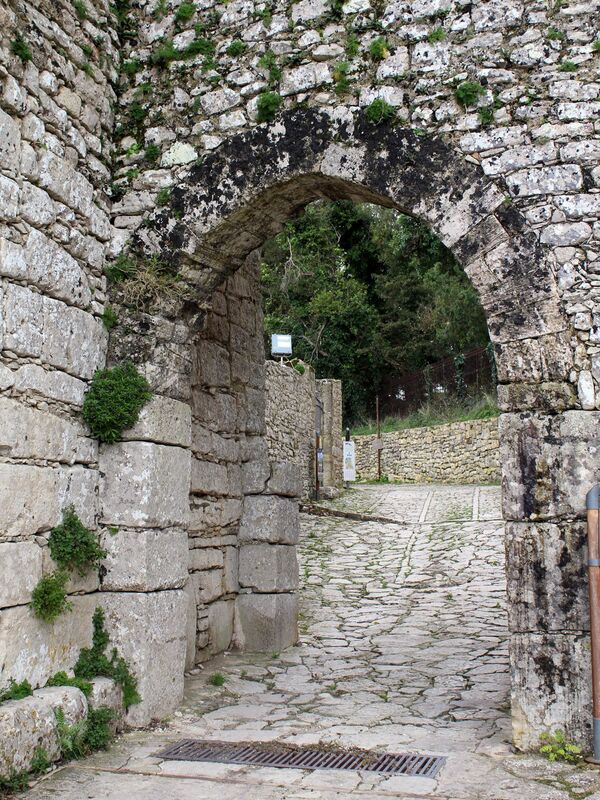 Although Erice is not walled anymore (with the exception of the short segment of cyclopean Punic walls) and has several “access” streets, the Porta Trapani marks the prestigious, historical entrance point. It leads to the first important site in the old town – Chiesa Matrice (Mother Church). Also from there uphill - Via Vittorio Emanuele leads to the town’s central point: Piazza Umberto I.
Porta Spada makes part of the old Phoenician walls. The name (eng. 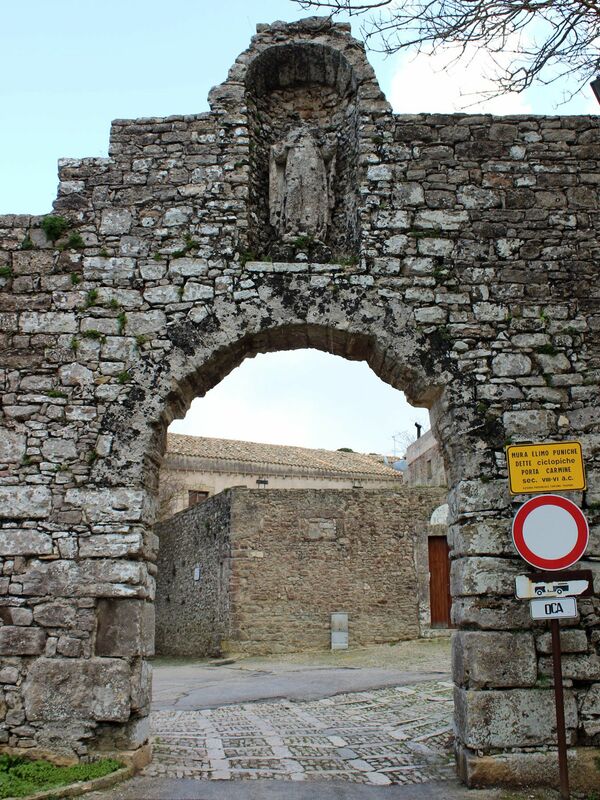 the Gate of Sword) reflects the tragic executions of soldiers by sword that took place near the gate during Sicilian Vesper Wars at the end of the 13th century. 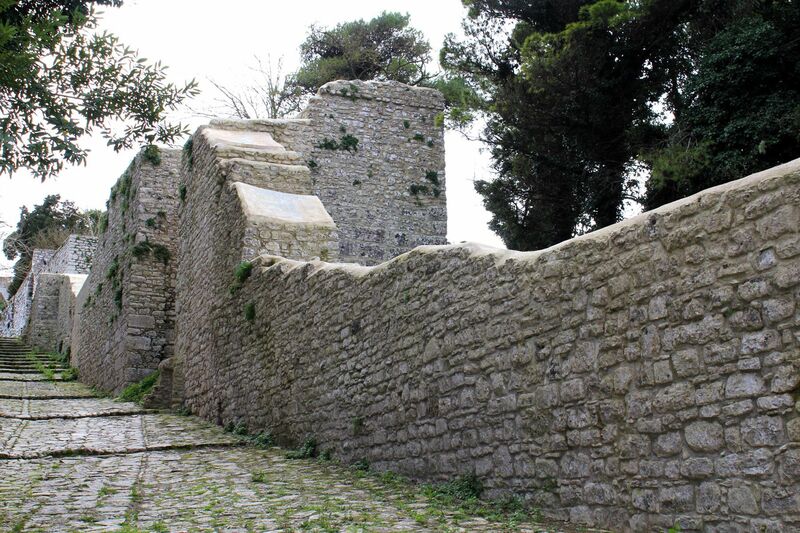 The walls made from enormous blocks of stone (for that reason called “cyclopean”) – are the oldest surviving elements of Carthaginian stronghold that once flourished at the top of the mountain. 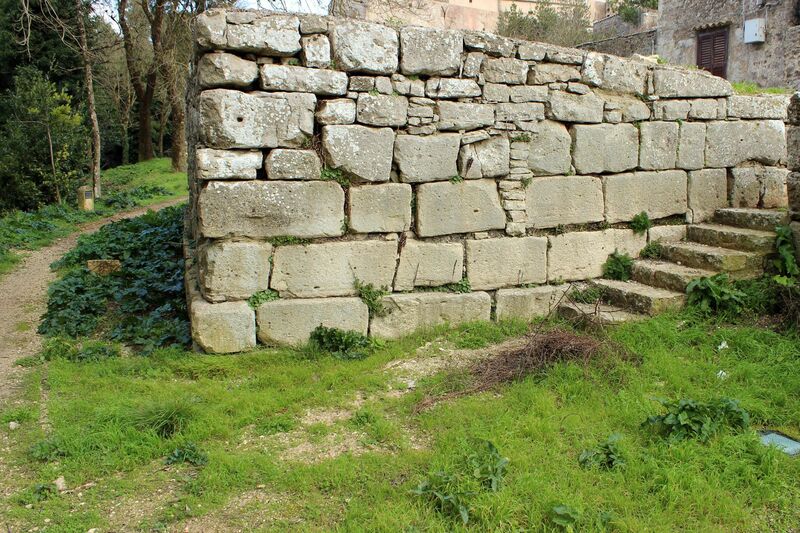 Today, surviving fragments of wall extend some 760 yards (700 meters) from Porta Spada to Porta Trapani. Porta Carmine stands in the middle of the existing section of the Punic walls (porta Trapani and Spada are on extreme ends of the wall). 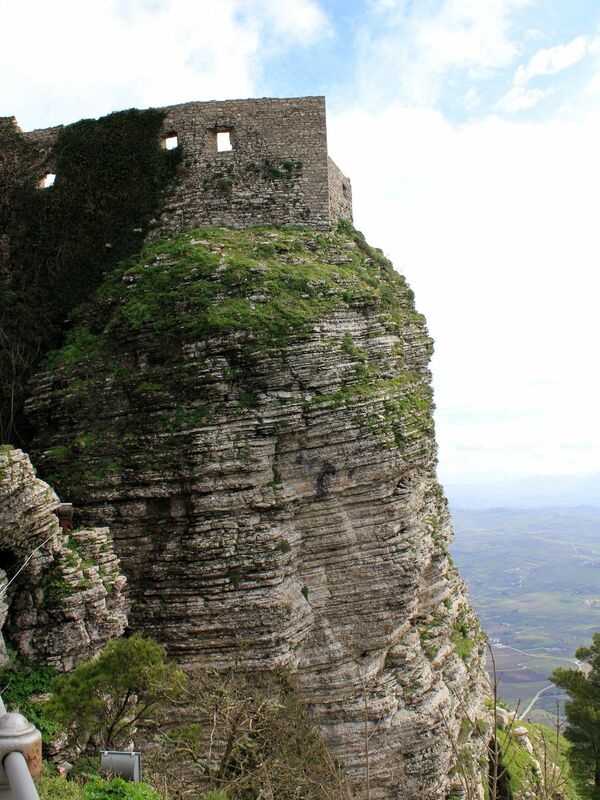 While the origins of all three gates go back to the Phoenician times, they also served the Norman’s Erice deep into the Middle Ages. 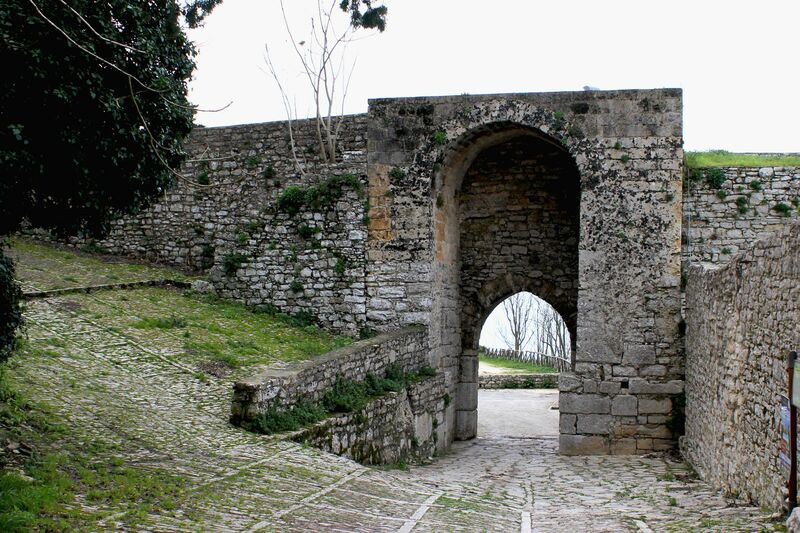 Throughout the time the gates underwent several modifications. 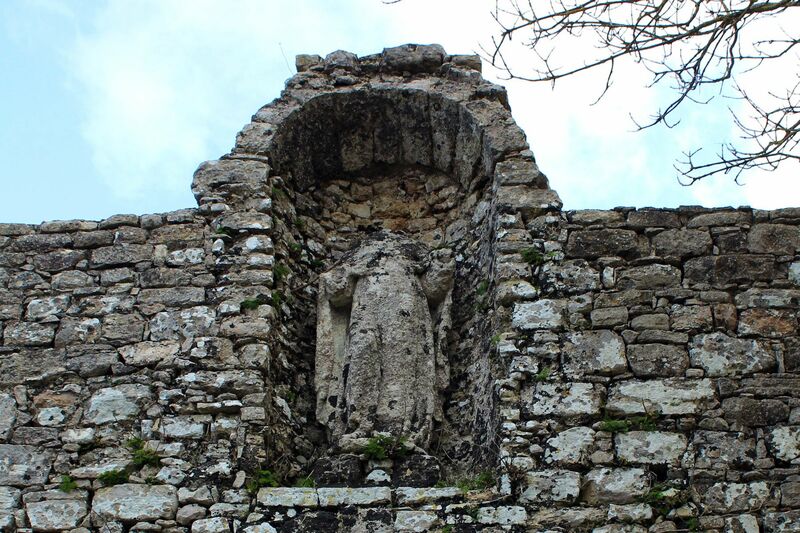 For example the niche above the Carmine Gate is an addition from 17th century and holds the statue of St. Albert (today headless and heavily damaged). 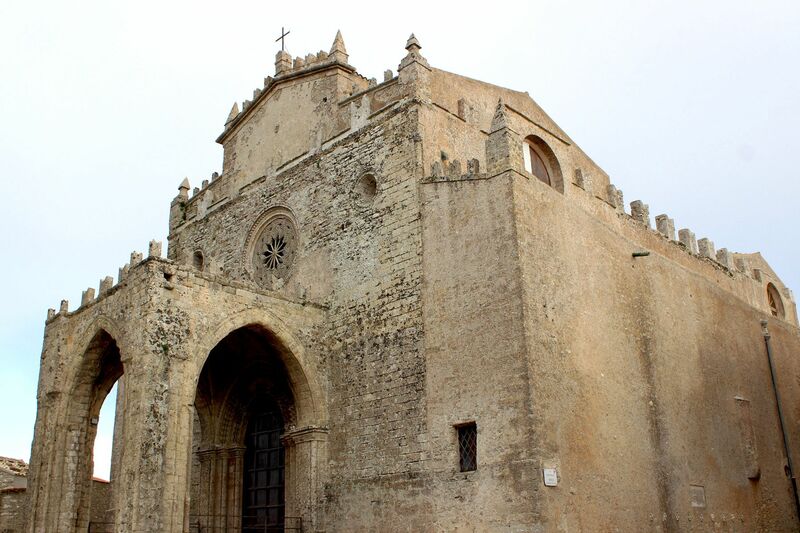 The Gothic Chiesa Matrice was built in 1314 at the order of Frederic III of Aragon. The church facing ancient Phoenician defensive walls was erected next to the watch tower. 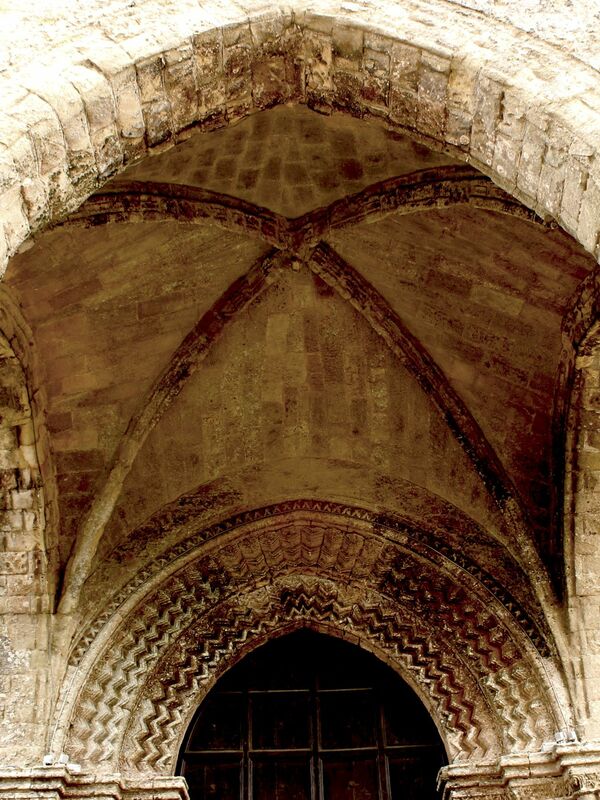 In 1426 a portico was added to the main façade “softening” clearly defensive shape of the church. 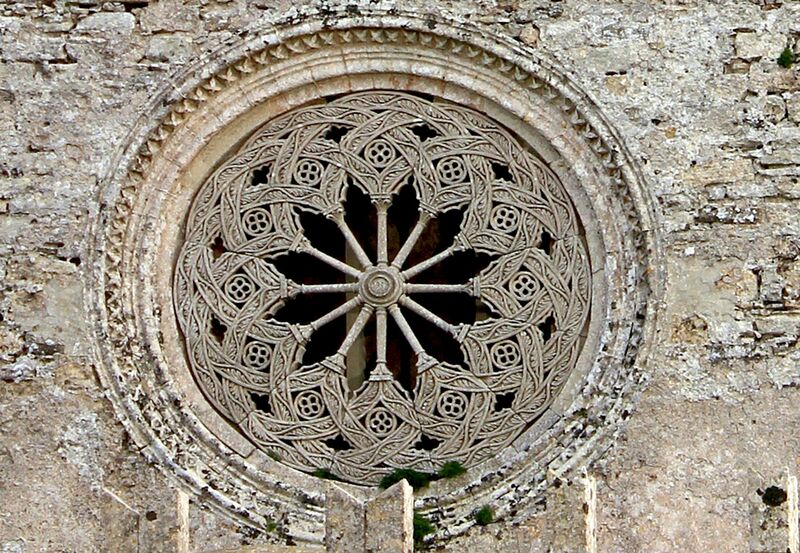 Unfortunately, it limits the view on the beautiful rose-window …..
After the collapse in 1853 the church was reconstructed in a neo-gothic style. It preserved however the original floor-plan with two rows of columns, three naves and four side-chapels as well as “austere” exterior walls. The most precious objects of religious art are Annunciation of Virgin by D. Gagini and the marble altarpiece by Giuliano Mancino from 1523. The latter is a composition of statues of saints and scenes from the life of Christ. 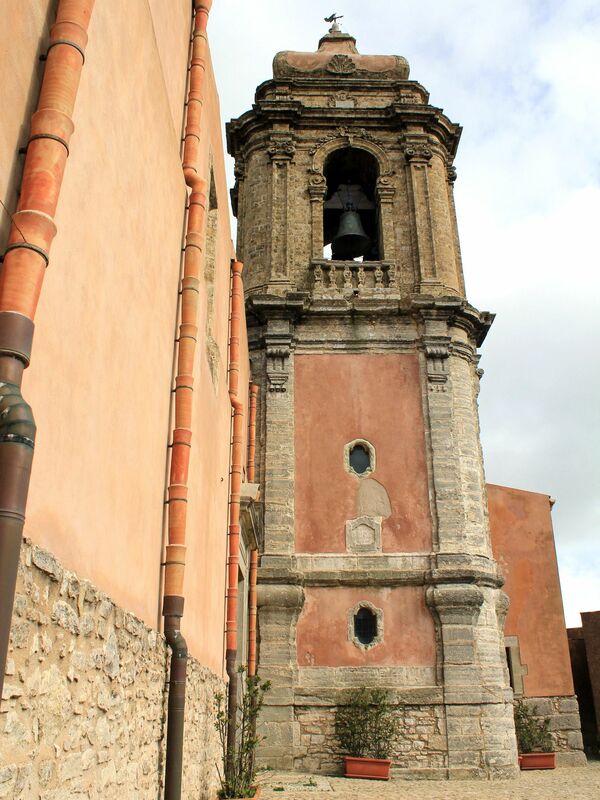 The standing-alone watch tower (Torre di Re Federico) was later “annexed” by the church to serve as a bell-tower. But it still keeps its original defensive characteristics with narrow slits in the lower section and beautiful mullioned windows in the upper part. 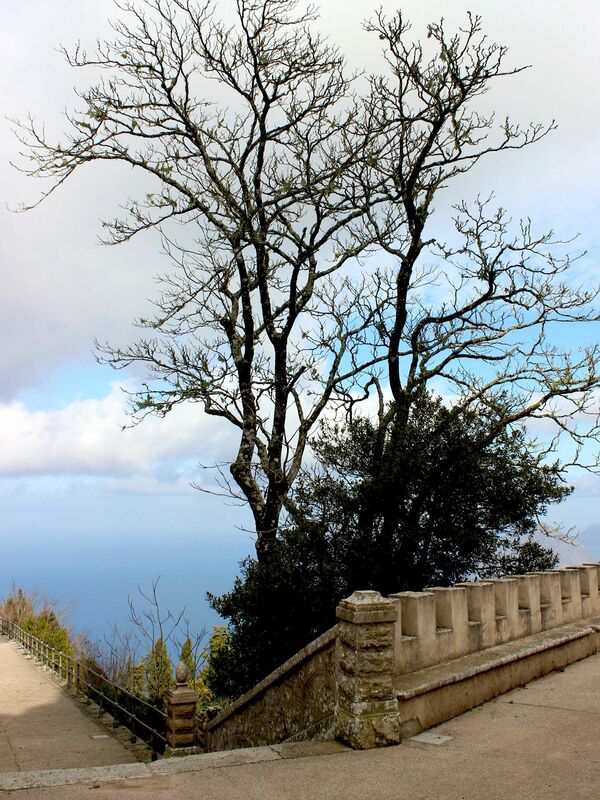 While conquering the tower requires some strength and determination (steep steps), the view from the top on Erice is worth of the effort. Currently, the tower houses a little museum. Other churches worth to visit are: San Giovanni Battista (located on a steep rocky outcrop), San Giuliano, San Martino, San Carmine, Sant’ Addolorata ….. Recently the castle got a serious face-lift and now it is open to the public, but so far the little space available inside is empty. 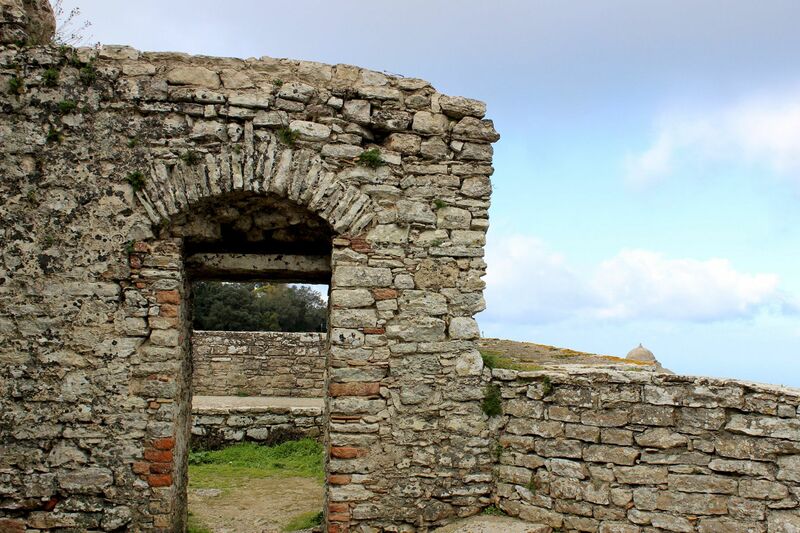 Besides stunning views from the galleries and towers on the Monte Cofano and Tyrrhenian Sea it also offers the unique feeling of entering the world of fairy-tale. But the best part of the Torretto Pepoli is seen from the outside. The castle is nestled on a seemingly inaccessible crag with very tiny space defined by plunging rocky walls. Seemingly hanging in the air, it seems so surrealistic, like taken straight from the world of dreams. 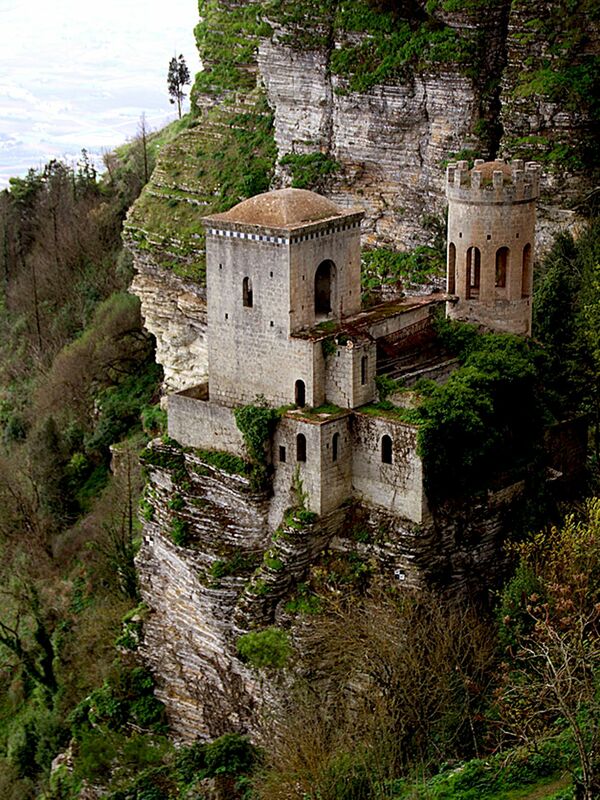 The castle is the property of the town of Erice. Located on Piazza Umberto, the museum houses collection of findings from the area reaching as far as to Carthaginian, Greek and Roman times. 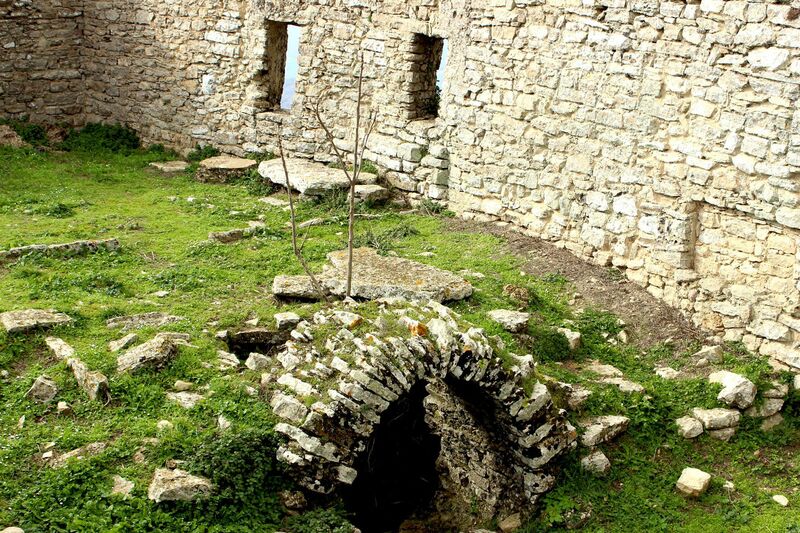 It displays ancient vases, coins, and other archeological artifacts but also religious artworks from Erice’s churches including paintings and statues. The most important piece of the ancient art is undoubtedly the head of Aphrodite – from the 4th century BC. While these little “things” are priceless, given their rarity and age, the most impressive part of the collection is certainly much younger sculpture of Annunciation by Sicilian artist Gagini. The Piazza Umberto with nearby streets is also the focal point of the town where you can find most of restaurants, cafes and shops. But undoubtedly a better place for small espresso or cappuccino and chat with your closest-one offers the café in Gardino del Balio. Tranquility and panoramic view from the terrace combined with the aroma of freshly brewed coffee adds new dimensions to the ritual coffee break. 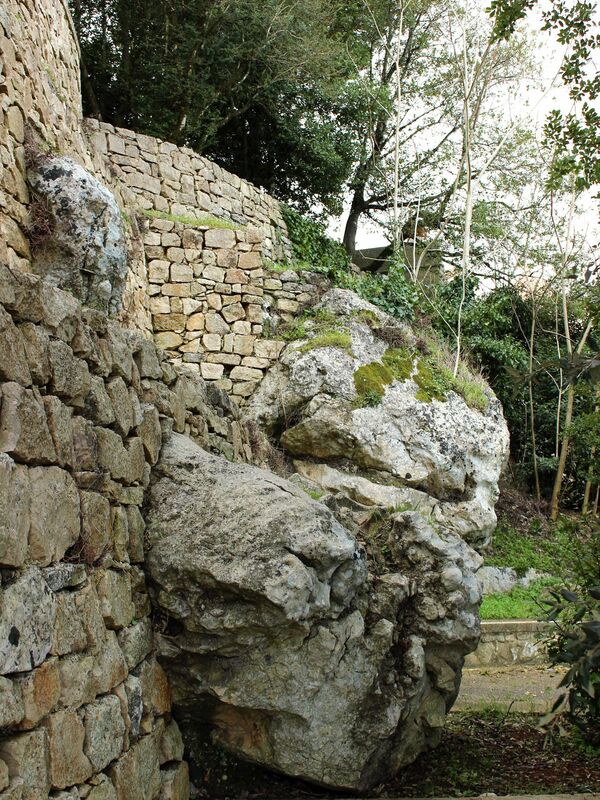 The Balio Garden was designed by Count Agostino Pepoli and is located next to the Castle of Venus. 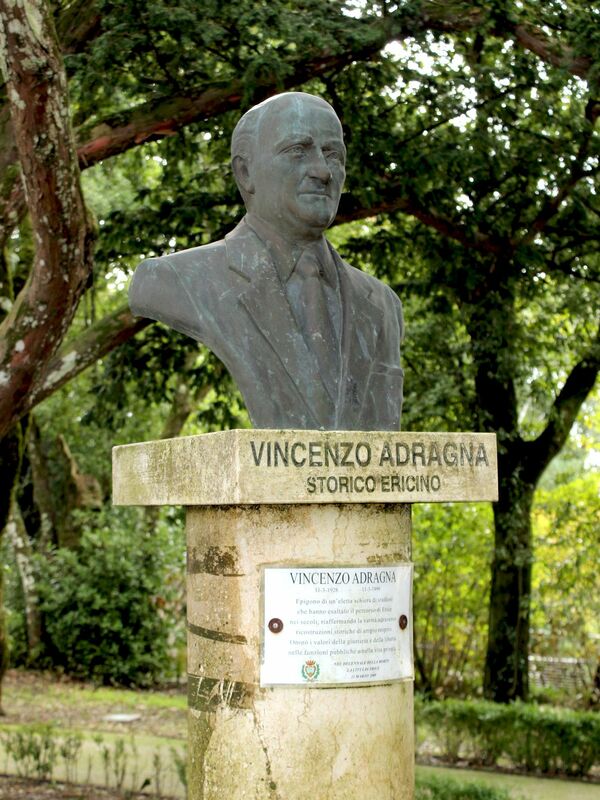 It is an English-style garden dotted with busts of famous personages from Erice - like Prof. Ugo Antonio Amico (humanist and poet), Vincenzo Adragna (renowned historian), Fr. 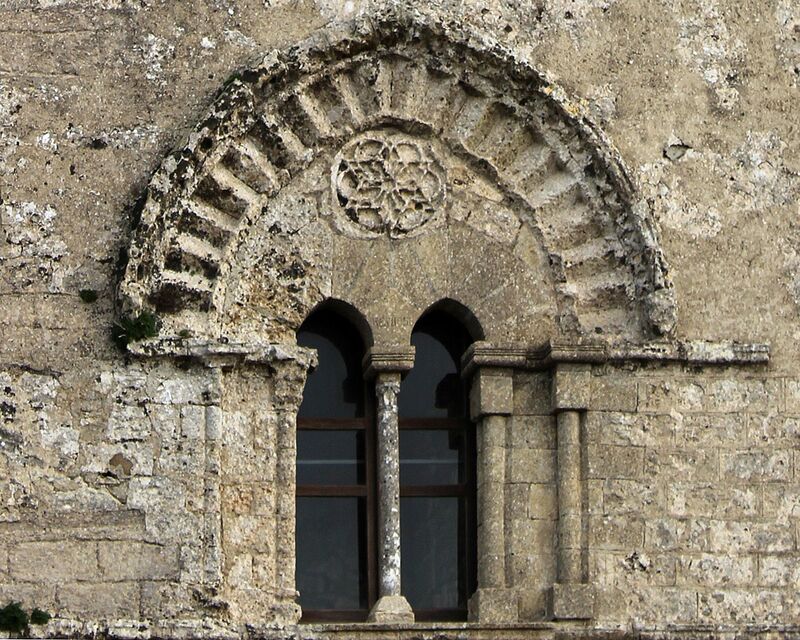 Giuseppe Vito Castronowo (theologian, but also poet and historian) – all born in Erice…. The name Balio was derived from the world “Baiuolo” – describing the Seat of Norman Governor that once stood in this place. 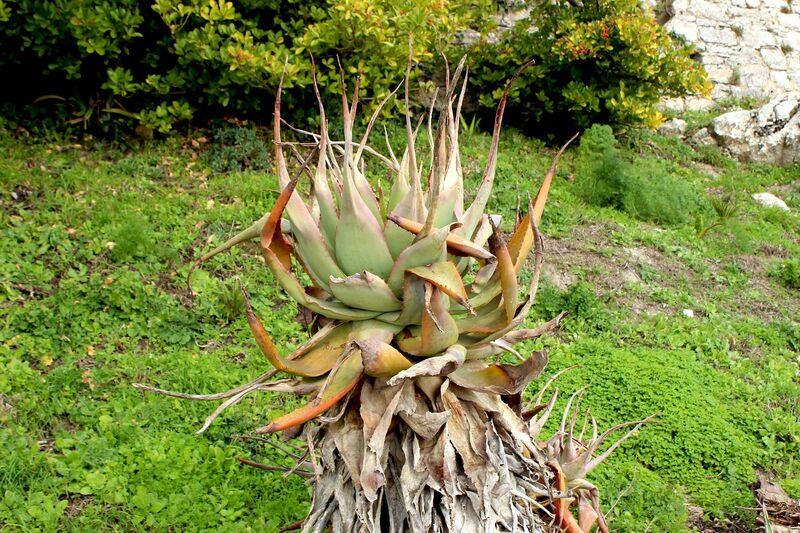 Garden’s vegetation consists of typical Mediterranean species like oaks, cypresses, pines… . What makes it a special place is the quietness and harmony contrasting with bare rocks and austerity of stone-paved streets in the old town. Wandering along the bitten paths or just taking a seat at one of benches leaves you in the company of “living nature”. 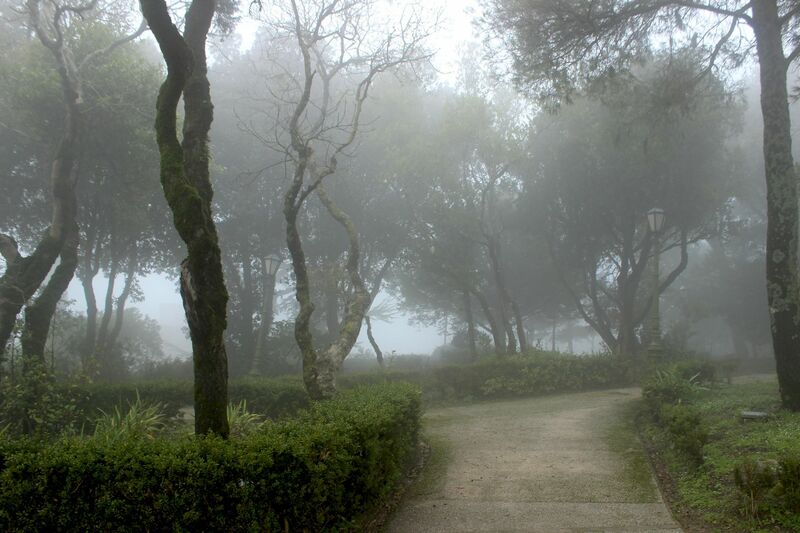 While eventual swirls of mist and clouds embracing the garden bring some mystery to this anyhow “sacred place”, the “openings” offer stunning views on the outside world bringing back the “temporarily” forgotten reality to which in fact we belong…. At the limits of the garden (next to the mentioned café-bar) there is a fountain with incarnation of Venus (or Aphrodite?). Not surprisingly (as the location obliges), she is shown in an immodest pose appropriate for the goddess of love. 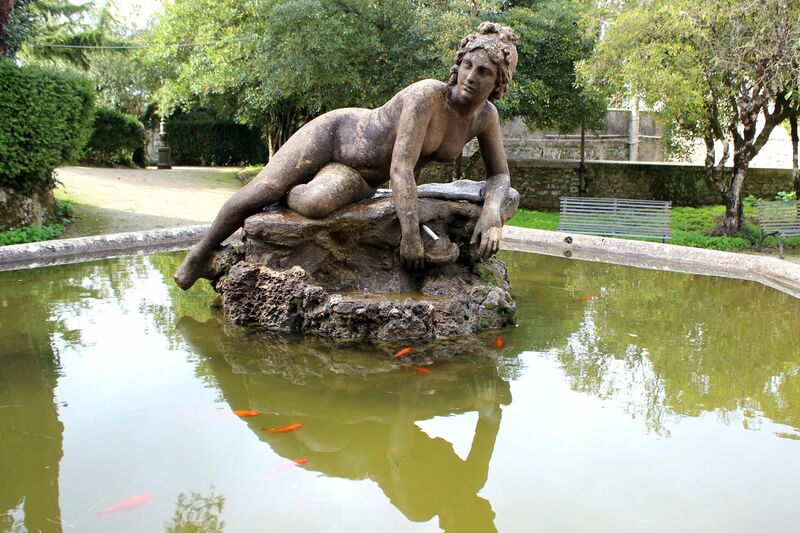 The Fountain of Venus proves that the ancient cult survived the time in much better shape than any stone structure…. Castle of Venus has formidable location! The castle was built over the ruins of the earlier Temple of Venus. It was sitting on the top of a huge flat rocky outcrop separated from the main part of the mountain by a deep moat. The drawbridge provided connection with the defensive Balio Towers standing at the eastern edge of the town. Today, not much is left from the formidable fortress. Actually the only testimony of its glorious past is an entrance tower standing at the end of the flight of stairs that at some time replaced the drawbridge. 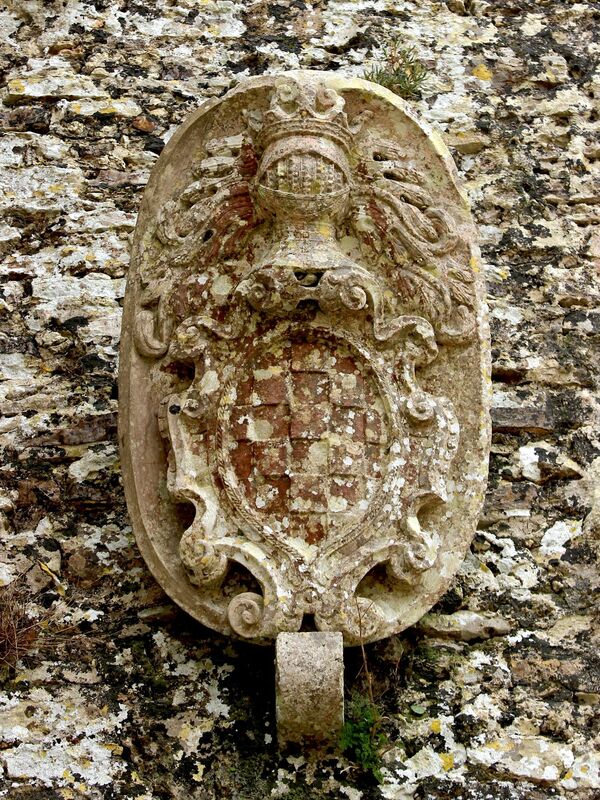 Above the gate there is a well preserved coat of arms of Charles V of Spain and at the upper level – a mullioned window. 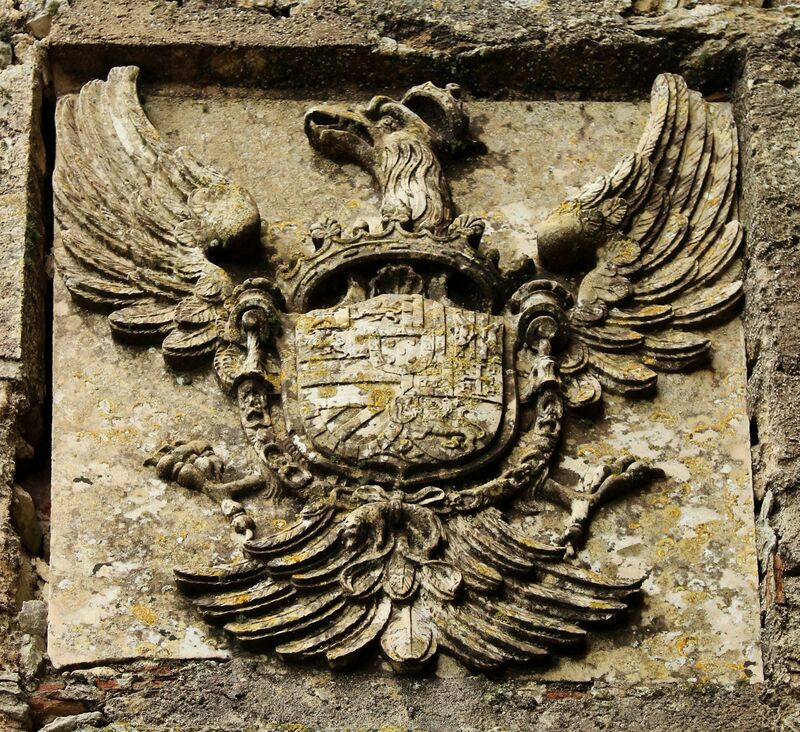 While the heraldic royal eagle matches the sheer power of the stone structure, the highly decorative window contrasts with the defensive character of the castle. Once you cross the gate all you can see is an open walled space of mostly bare rock. Multiple signs with detailed description of now non-existing fragments of the fortress and ancient temples serve as self-guides for visitors. But frankly, all is left to your imagination. In reality, the best you can make out of this tour is to enjoy the remarkable panoramic views at the areas surrounding the Monte San Giuliano. You can take the switchback road climbing up to the top. By all standards the road is not technically difficult and is wide more than enough to peacefully navigate “encounters” with vehicle coming from the opposite directions. Few platforms offer enjoyable scenic views. However once you arrive at the top, you should leave the car in the parking area. Streets are too narrow, many have limited access only for local traffic and you can only dream to find the parking place. Frankly the best and most exciting option even for motorized tourists is to take the cable car (Funivia) running from the outskirts of Trapani. For about 6.5 Euros your journey will start (and end) with exceptional panoramic views over Trapani, sea and Egadi Islands. Medieval Village Erice is relatively small so in one day you can easily explore all its secrets on your own and at your own pace and still find the time to relax. Numerous maps with marked historical monuments and suggested tourist itineraries are very helpful (short info is written in Italian, English, French, German and Spanish).